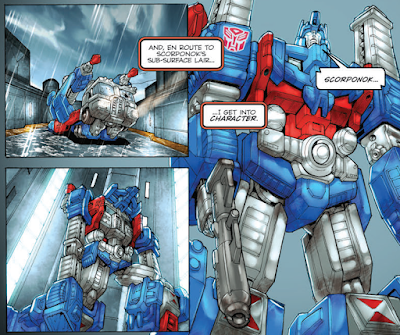 Science's Less Accurate Grandmother: Review: The Transformers Spotlight by Simon Furman, et al. Review: The Transformers Spotlight by Simon Furman, et al. Some reading orders for IDW's Transformers continuity place this before Infiltration, the story actually published first by IDW. I suppose this is because it supplies backstory, but I didn't find the Spotlight volume a very satisfactory read on its own, at a point where the only IDW volume I'd read was Autocracy. These are pretty generic stories of robots that don't really say much of interest. Shockwave is very logical, did you know? The Nightbeat story is a noir pastiche, but really gets lost in foreshadowing... something, vaguely. The Hot Rod and Sixshot stories I don't even remember at this point. I wanted to like the Ultra Magnus tale, because I like the idea of Ultra Magnus (I like any character who really likes rules, because I really like rules), but nothing in it grabbed me, and I'm still not entirely sure what it means to enforce the Tyrest Accords. Still, don't mess with this guy. If you're reading IDW's Transformers stuff in order, Infiltration makes a much better introduction to the series's original set-up. Next Week: The Transformers come to Earth... or are they already among us? Find out, in Infiltration!